Whether you're just starting out on the Net or a seasoned veteran, you can have a website design which will make your presence known. You can have your site designed and totally managed for you, saving you all the hassle. Or if you prefer, you can have a site that you can log in and update for yourself! Website designed, up to five information pages in total, using any existing company logo and artwork†. Updates performed on this design package will be charged an hourly rate of $25. Alternatively, a negotiable monthly maintenance fee will provide unlimited updates. This package includes a Latest News page, where you can publish (or remove) stories and messages, at your convenience. See it in action at the Demo site by clicking the 'Latest News' menu link. Try out the Demo site by clicking the picture to the right. Joker Designs can show you your website's work-in-progress via a private Web address known only to you. This allows you to see the design proposals quickly, at your convenience, and make timely approvals or revisions. * Any maintenance or alterations that fall outside the scope of this package will be charged an hourly rate of $25. † Design work for company logo or artwork will be charged separately -- see the Logos and Brands Designs section for more information. 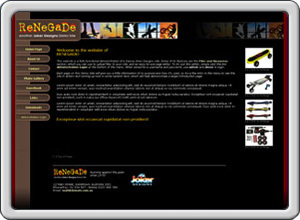 Website designed, up to ten information pages in total, using any existing company logo and artwork†. You can then maintain it yourself using the simple log-in and page-editing system on the site. The page-editing system is very easy to use, and offers most of the text settings used in most word-processing software (like the Microsoft Word settings of Bold, Underline, Italic, Insert Image, etc). Try out the Demo site by clicking the picture to the right. To test the editing system, visit the Demo site and click the 'Administration Login' link at the bottom of the side menu. When asked for a username and password, use admin and demo to login. If you are looking for some technical or graphical help with your existing site, or even if you want a completely new design, please contact me. I charge a modest hourly rate, and I would be happy to give you an estimate. Pay annually and receive two months hosting absolutely FREE! There are many packages to choose from, the basic package above lists only some of the benefits of their hosting services. Check their site for current prices and offerings at http://www.tashosting.com. If you'd like to have a look through the design portfolio of websites produced by Joker Designs, please browse the Web Design portfolio and see what can be achieved. 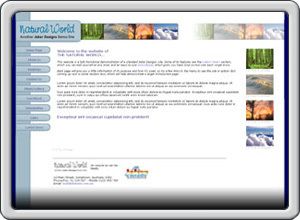 The page showcases just some of the web design options available to you. If you can imagine it, you can be supplied with it!